Do you love bacon? 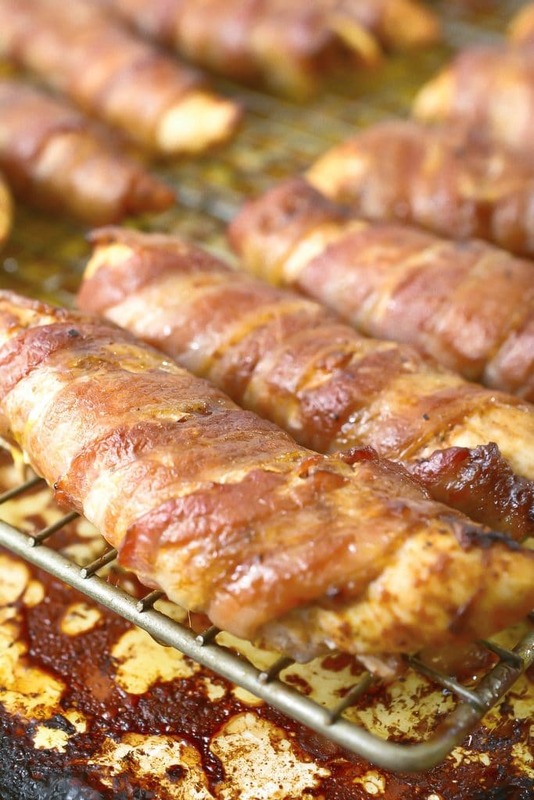 This keto bacon wrapped chicken is perfect for the bacon lovers in your life. My husband loves bacon so much, he thinks it should be added as its own separate food group (what is it with guys and bacon?). 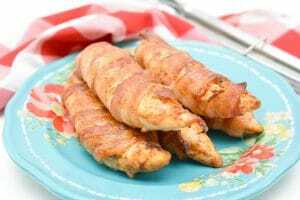 If you are looking for a recipe to fit in your keto diet and to satisfy that bacon craving, give this keto bacon wrapped chicken recipe a try! To begin assembling the Keto bacon wrapped chicken, place the chicken tenders in a large bowl. Now add the seasonings to the bowl: paprika, chili powder, cumin, onion powder, and garlic powder. Give the chicken a good toss to spread that delicious flavor around. Then, add salt and pepper to taste. Salt and pepper to taste is often one thing that people have trouble with. Salt, in particular, really helps to enhance the other flavors in the dish. Most often, people tend to go a little too easy on the salt and pepper and wonder why the food turns out bland. 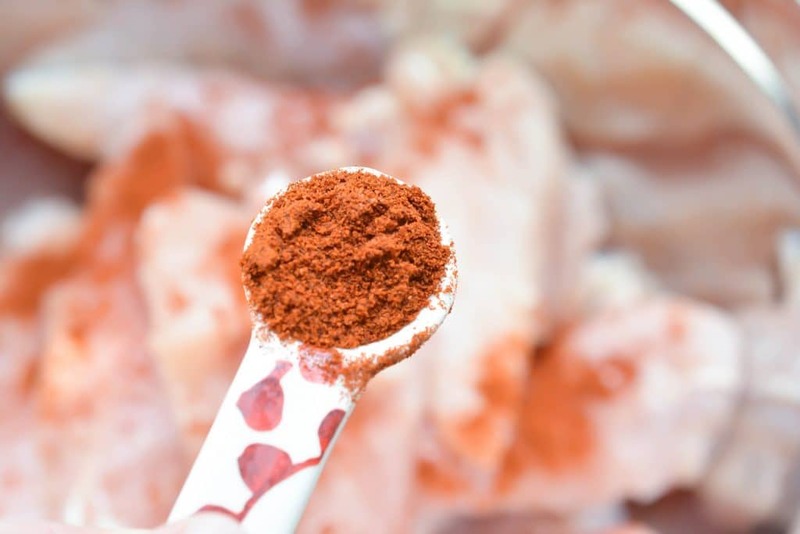 Check out this 5 dinners 1 Hour post to get tips on seasoning your food. Now it is time to add the best part of the keto bacon wrapped chicken: the bacon! Tightly wrap each seasoned chicken tender with a piece of bacon. You can secure the bacon with a toothpick, if you would like, but it is not necessary. If you like extra crispy bacon, you can partially cook the bacon before you wrap the chicken. Just make sure you let it completely cool before assembling. Also, cooking it on a baking rack will help the bacon cook more evenly on both sides. At this point, you could put the chicken in the fridge if you are prepping this recipe ahead of time. All of the recipes on the 5 dinners 1 Hour meal plans are meant to be prepped ahead of time, which will save your sanity during the week! 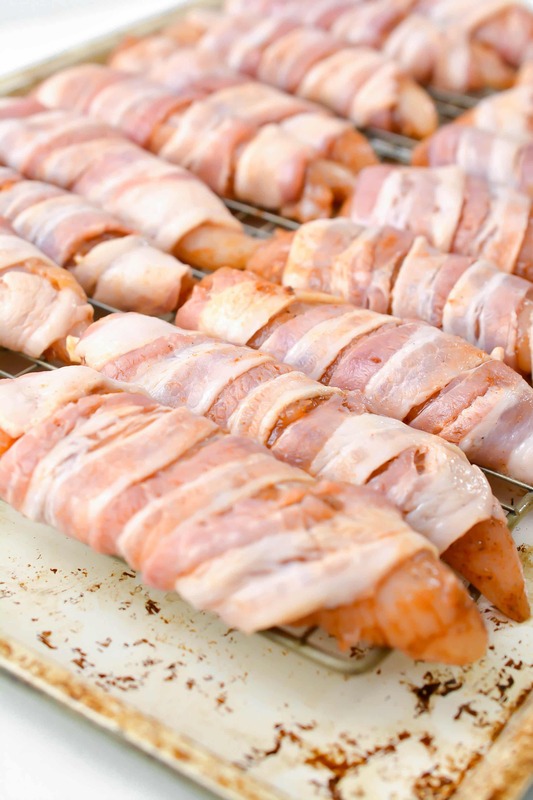 Once the keto bacon wrapped chicken is all assembled, it is time to bake it up! Bake for 20 minutes, or until the chicken is cooked through and the bacon begins to crisp. 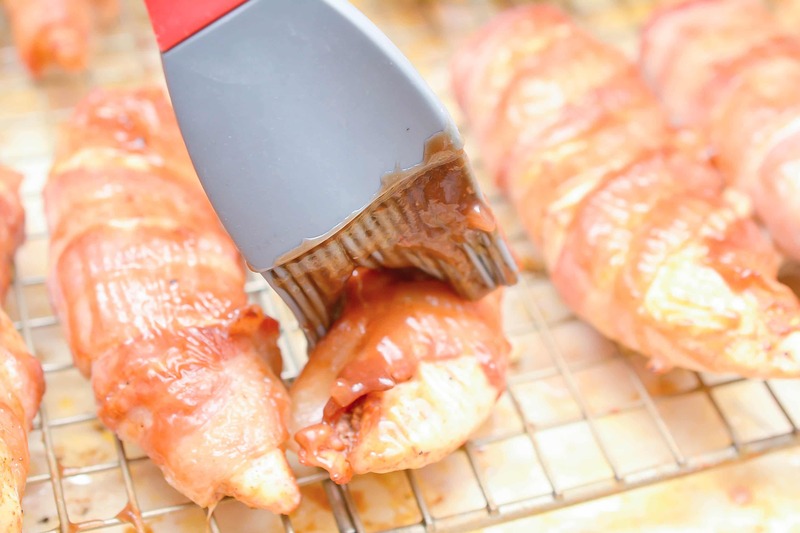 Remove the bacon wrapped chicken from the oven and baste with a keto-friendly BBQ sauce. There are a few different brands of sugar-free BBQ sauces in the stores. The last step is to put the chicken back in the oven for another 3-4 minutes. This will help to caramelize the sauce and help it stick better to the chicken. Voila! Yummy keto bacon wrapped chicken! Now, wasn’t that easy? In case you missed our last post, there is another keto recipe here for cheesy bacon egg muffins! 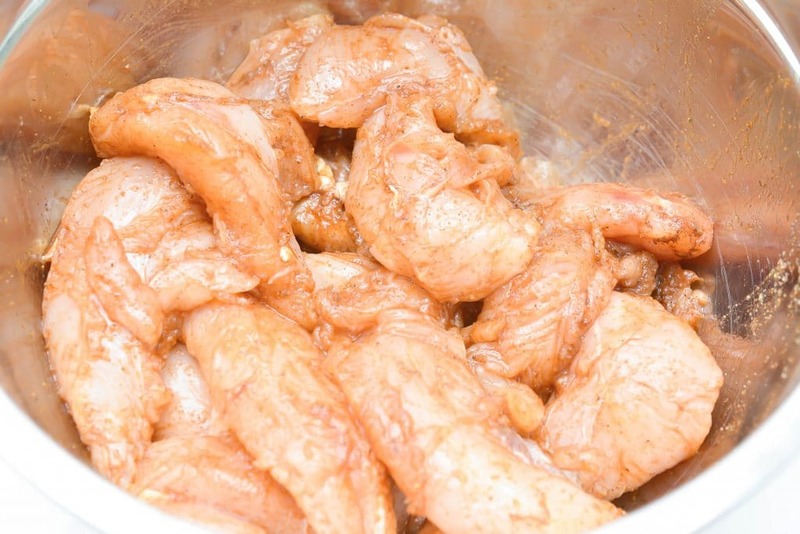 Place the chicken tenders in a large mixing bowl. Add the paprika, chili powder and cumin to the bowl. Place the onion powder, garlic powder, and salt and pepper to taste in the bowl. Combine all of the ingredients well until each tender is coated in the seasonings. Wrap each seasoned chicken tender in a strip of bacon, and place them on a baking rack. Bake for 20 minutes until the chicken is cooked through, and the bacon begins to crisp. Remove the chicken tenders from the oven, and use a basting brush to place a layer of sugar-free keto-friendly BBQ sauce on each one. Return the chicken tenders to the oven for another 3-4 minutes until the sauce begins to caramelize on the tenders.